Coaching - a U15 boys team with UBUNTU Sports. This is an unique soccer academy program that combines premier coaching, quality education with Biblical principles to raise up godly African leaders. See the photos and watch the video from the first Soccer Festival. Coaches Training - Karl is developing a training program for local African men on how to become excellent soccer coaches and be a positive influence on the younger generation...which includes a coaching certification. Note: This is so exciting, as the community center in Ocean View, although currently scheduled to be built in 2012, is taking longer to be finalized than we hoped. This new soccer ministry can be started without the community center and can easily be moved to that facility once the community center is ready. Someone recently said to Karl..."Wow...those kids in Africa must sure feel lucky to have a coach with your experience teaching them soccer skills." Sure, teaching kids to play great soccer is nice. I love the game...seeing a boy's eyes light up when they finally master a difficult skill, teaching the true meaning of teamwork, inspiring them to work hard and try new things. But beyond that - I'm excited about soccer ministry because it gives me a chance to show kids that someone cares about THEM. For many of these kids, I may be the only man in their life that doesn't yell at them, swear at them, or hit them. It's possible that I may be the only person that loves them. I want each child to feel the love of Jesus through me. Karl Ostrand grew up in Virginia Beach, Virginia. After playing soccer in a club and at school, he realized his passion was to mentor youth. He is excited to use soccer as a tool to teach boys how to become the kind of men who will have a positive influence on their families and communities! In 2002 he began coaching with Gladiator Soccer Club in Omaha, which later became Omaha FC - the largest soccer club in Omaha Nebraska (with over 4000 kids). Karl was the head coach of the 95/96 boys teams at Omaha FC. 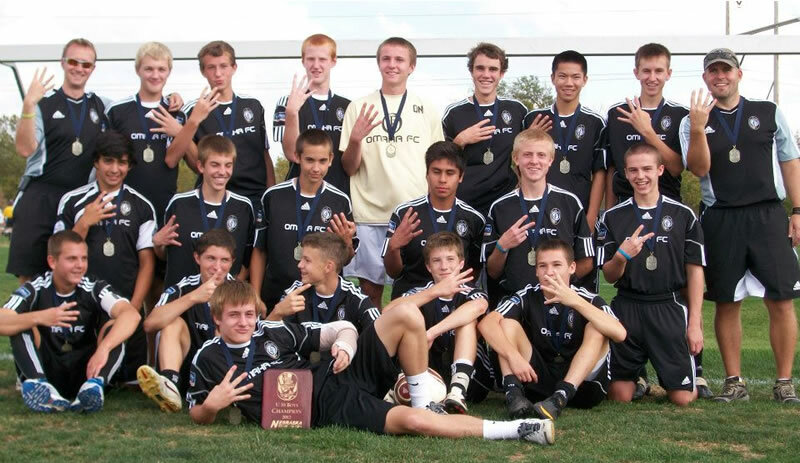 The boys he started coaching when they were 8 years old are now a 4 time state cup champion, having never lost a state cup game played. He was on the staff of the Game-Winner Striker’s Camp and Omaha Soccer Academy. Karl was also the assistant coach at Brownell Talbot from 2004 to 2006. He helped turn around a program that went from 1-11 to 8-4-1 in just one season. He was the Director of Operations for the Omaha FC soccer club and founded and directed The Omaha Futsal League. Karl currently holds a Premier Diploma and Director of Coaching diploma from the National Soccer Coaches Association of America. In 2010, Karl and his family quit their jobs and moved to Cape Town, South Africa. There, they are on staff with All Nations, an interdenominational Christian, non-profit (501C3, ) that provides specialized leadership and discipleship schools. They currently serve in a township that is plagued by gangs, drugs, alcohol abuse and sexual & physical abuse. Karl continues to use soccer as a platform to mentor youth in Africa, coaching a boys team with Ubuntu Sports and is starting Soccer Festivals in 2012. He will also be training African men on how to become excellent coaches and a mentor to the next generation. He hopes to see lives radically changed and give hope to the hopeless! Karl is married to his wife of 10 years, Julie. They have three little girls - Jensen, Emerson and Adison.